The secret “hatch” set with super tight security was active once again today and our source confirmed that Josh Holloway (Sawyer) was on set and sent along some set pics of the shiny new Dharma Van. This entry was posted in Uncategorized and tagged Filming Updates, Josh Holloway, Sawyer, Season 6, Set Photos on December 27, 2018 by admin. Update: 9th September Thanks again to bathala for these couple of new photos from the Airport filming. Update: 21:20 One of the guys at the airport set has told us that this is NOT a Flashback or dream sequence. Update: 20:50 Here is a little bit more from Ryan in Hawaii. Indeed, expected on the set were Matthew Fox (Jack), Evangeline Lilly (Kate), Josh Holloway (Sawyer) and Naveen Andrews (Sayid). But the first hardworking actor sighted was none other than Daniel Roebuck, who played the hapless (and previously detonated) Dr. Leslie Arzt. Looks like things pick up immediately after Juliet hits the bomb because the construction site looks like the Swan after it got sucked in. Jack, Kate, Sawyer, Miles, Jin were there. Saw Sawyer upset over Juliet’s actions and runs toward the hole which is now stuffed with all the metal from the site. Also saw them and some stunt doubles clumb out of the hole using vines/rope. Didn’t see them filming, but saw Hurley and Sayid around set. Sayid’s Dharma uniform was covered in a lot of blood so it looks like he’s still hurt from last season. Update: 20:31 Thanks to Glen for the heads up on this other photo from bathala who is also on the set. Last week we received a tip on a potential location for filming and our source asked us to keep it quite, but it seems like it is no longer a secret. 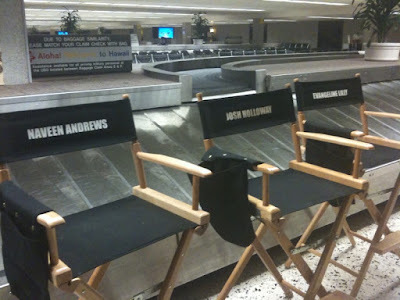 DocArzt it seems via Ryan in Hawaii or perhaps being in Hawaii himself has grabbed a pic of some of the cast members chairs in an airport baggage claim. 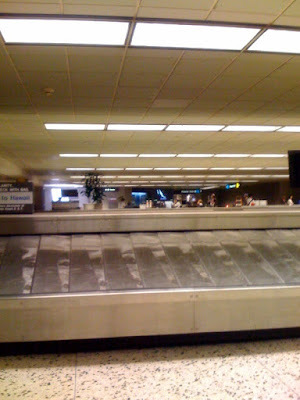 Yup, the LOST Cast and crew are setting up shop at Honolulu Airport to film some airport scenes and so it does seem like we will get the potential reset or Alternate Timeline story of the Losties arriving LAX!! As you can see at least Naveen Andrews, Josh Holloway and Evangeline Lilly if not more will be on set. Here is the pic and we hope to have more details from the set later today and the rest of the week stay tuned! Whoever took the pic. Thanks! This entry was posted in Uncategorized and tagged Doc Arzt, Kate, LA X, Sawyer, Sayid, Season 6, Set Photos on December 25, 2018 by admin. Thanks to Susan for the scans. This entry was posted in Uncategorized and tagged Charlie, claire, Daniel Faraday, Dominic Monaghan, Elizabeth Mitchell, Emilie de Ravin, Ian Somerhalder, Jeremy Davies, Juliet, Magazines, Sawyer, TV Guide on December 24, 2018 by admin. Does Mr. Friendly Know The End Of Lost?